Vincenzo Martinelli worked in Bologna as a painter and as a scenic designer for the theatres in that city. He was best known for his landscapes that he painted both on canvas and as fresco's. He created paintings for the Palazzo Pallavacini and the Palazzo Bentivoglio di via Belle Arti. 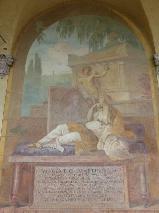 From 1767 to 1803 he was a teacher at the Accademia Clementina. Together with several collegues he was excluded when the Accademia Nazionale delle Belle Arti was formed in 1804. He died in 1807 and his tomb at the Cimitero monumentale della Certosa di Bologna was designed by Pietro Fancelli (1764-1850). The tomb of Vincenzo Martinelli at the Cimitero monumentale della Certosa, Bologna.